Photograph courtesy Roger Geach. 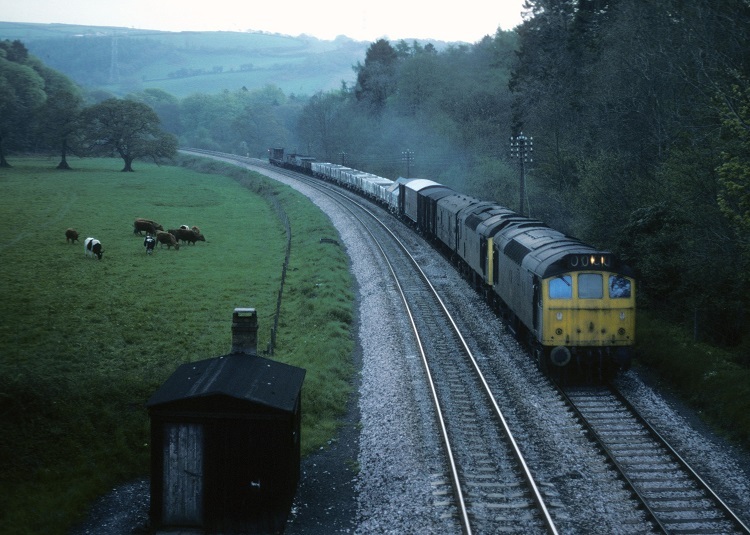 The light is starting to fade as 25206 & 25207 approach Respryn Bridge on May 10th 1978. They are working the 6M86 St Blazey - Carlisle freight, the service was often a pair of Class 25s at least as far as Exeter Riverside during 1978. The train would often run early following the 18.08 Penzance to Birmingham passenger/mails. The twenty year ten month career of D7556/25206 saw it allocated to a multitude of London Midland depots and thirty months to Plymouth Laira. Time between withdrawal & scrapping: 111 months. April 1971 to Preston Division (D10). October 1972 to Nottingham Division (D16). 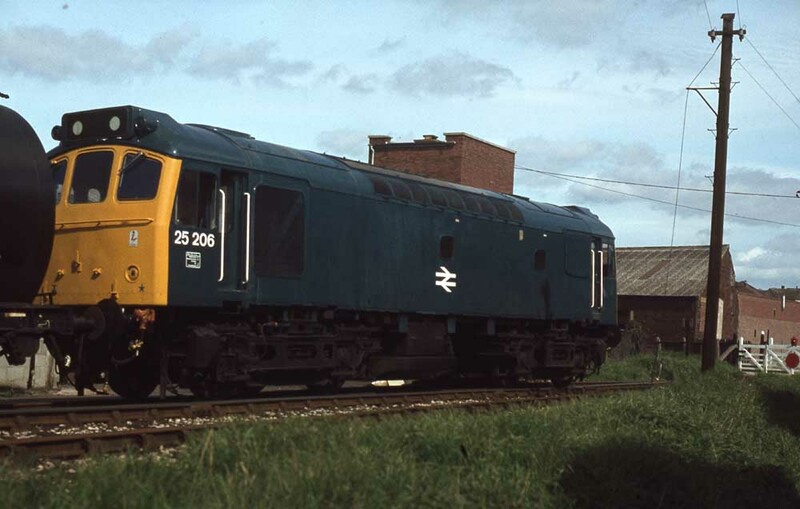 25206 was the 279th Class 25 withdrawn, one of six retired during March 1986. After withdrawal 25206 was stored at Bescot until March 20th 1990 when it was moved to BRML Doncaster for spares removal (including compressors & traction motors) to assist D7672 Tamworth Castle. 25206 was moved to MC Metals, Glasgow by road on March 17th 1995 and scrapped there by the third week of June 1995. Noted Derby Works April & May 1974 (dual brakes fitted). Noted Derby Works March - May 1979 (general repair). Noted Derby Works December 1983 (N1 repairs). D7556/25206's first recorded passenger working took place on June 4th 1966 working a summer dated roundtrip Nottingham - Llandudno Town with D7589. Condition March: two-tone green livery with small yellow warning panels, hand/footholds still present. Condition August: two-tone green livery with full yellow ends. Condition October: two-tone green livery with full yellow ends. With lengthy periods allocated to Toton & Bescot 25206 managed a number of summer seaside visits. 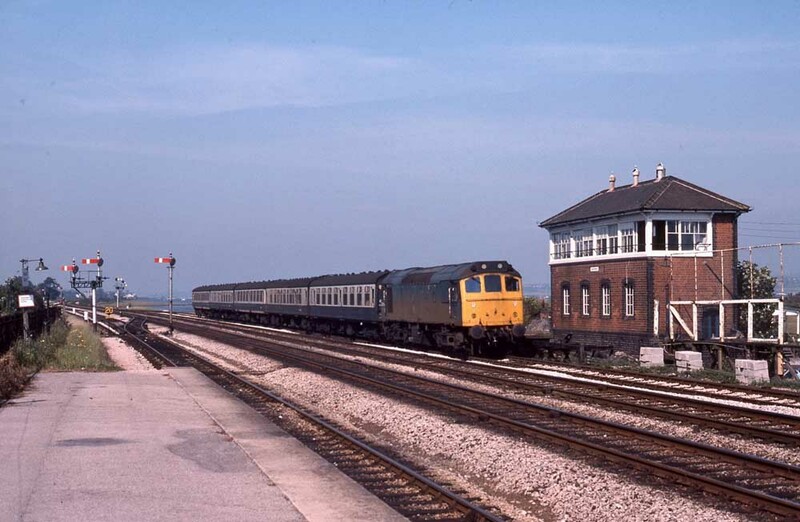 It was a return to the North Wales coast on August 16th 1975 working the 07.35 Nottingham - Llandudno Town and 13.00 return. On June 5th 25206 & 25245 worked a roundtrip Derby - Skegness. On September 9th 40162 failed at Ely working the early morning Whitemoor - Bury freight, the Class 40 was replaced by 25206. A week later on September 16th the 13.33 Taunton - Cardiff was worked by 25206. Permanent way work at Wigston on July 24th utilised 25206, 25295 & 45055. On August 20th the Derby - Norwich - Yarmouth - Norwich - Derby diagram was worked by 25206 & 25202. During March 25206 was transferred to Laira and although not boiler equipped it was frequently noted on the Exeter area passenger workings. On March 29th 25206 & 25207 were marshalled at each end of a china clay train for the journey from Newquay to St Blazey yard. 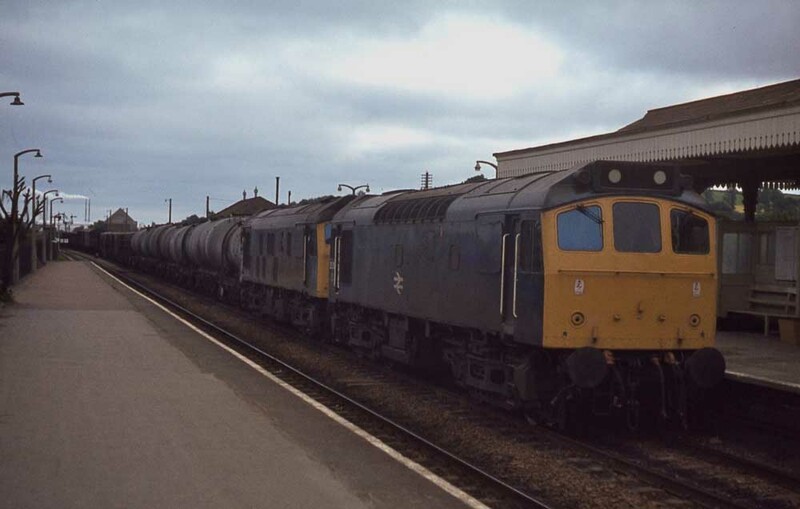 During the third week of April 25206 & 25207 were noted running together, on April 14th they worked a St Blazey - Carlisle freight as far as Exeter Riverside and on April 21st they worked a St Blazey - Temple Mills freight to Exeter Riverside. On July 26th 25206 worked the 16.40 Plymouth - Paignton. On August 1st 25206 worked the 09.55 Exeter St Davids - Paignton, the return 11.10 Paignton - Exeter St Davids, the 17.30 Paignton - Exeter St Davids and the 18.44 Exeter St Davids Paignton. On August 5th 25206 worked the 10.00 Barnstaple - Exeter St Davids, the 08.25 Paddington - Barnstaple from Exeter and the return 14.40 Barnstaple - Paddington to Exeter. Photograph courtesy Peter Lovell. 25206 waits to leave from Yeoford on August 5th 1978 with the 08.25 Paddington - Barnstaple. The use of a Class 25 indicates a change of engine at Exeter. The train had either arrived with a Class 47 or Class 31. 25206 & 37142 worked the 20.50 St Blazey - Temple Mills to Exeter Riverside on September 22nd. Heavy snow over the New Year plagued services with delays and faulty equipment making life even more difficult to maintain the timetable. In the West Country Exeter proved to be a graveyard for frozen up locomotives, with temperatures reaching down to –13C most things simply froze up. At Exeter the local services were cancelled with the diesel multiple units frozen solid. The diesels fared little better with eighteen frozen up locomotives including 25052, 25206/225/263, the only serviceable machine being 46020, which had been equipped with steam lances for the freeing of pointwork and rodding. Photograph courtesy Peter Lovell. The paintwork glistens on recently outshopped 25206 as it shunts bitumen tanks at Exeter City Basin on May 7th 1979, a duty shared with Class 08 shunters. Over the years bitumen, petrol and coal for the gasworks would have come into the complex at city Basin. Photograph courtesy Peter Lovell. 25206 & 25225 have arrived at Par on an overcast June 28th 1979 with a lengthy freight. The fuel tanks and cement wagons suggest this train has originated at Penzance. On October 15th 25225 & 25206 worked loaded clay wagons from Drinnick Mill to Burngullow during the afternoon. On October 19th 25206 was noted westbound at Lostwithiel with clay empties. 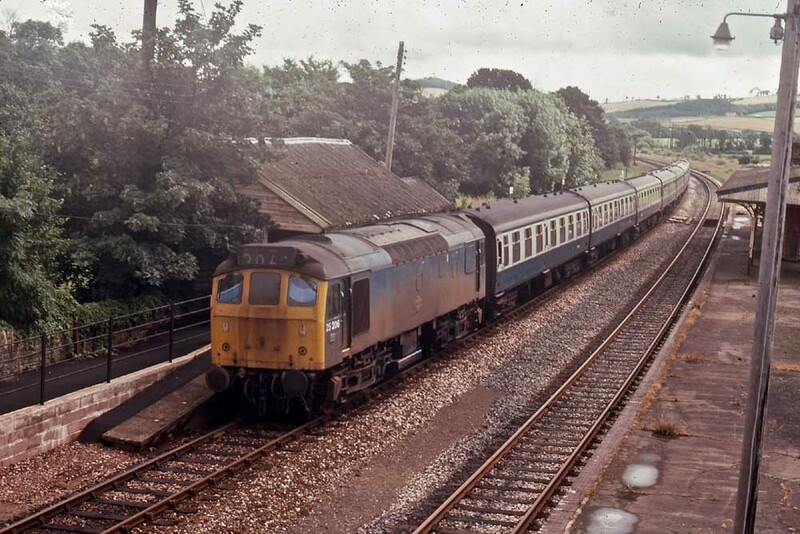 On June 22nd 1980 a Torrington - Plymouth excursion was worked by 25058 & 25206 to Exeter, then 50027 roundtrip to Plymouth and 33028 from Exeter back to Torrington. Photograph courtesy Peter Lovell. 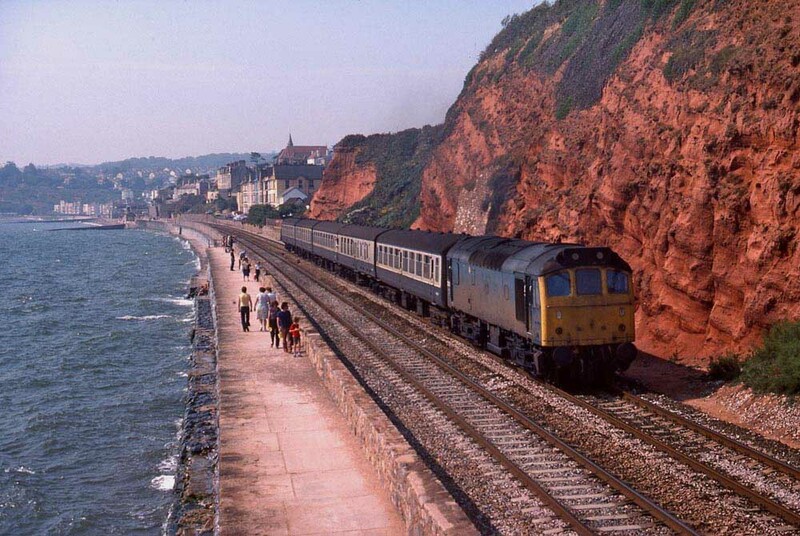 The summer stopping trains are almost over for both the 1980 season and for the Class 25s. 25206 eases into the loop at Dawlish Warren on September 2nd 1980 with the 14.20 Exeter - Paignton, a couple of MkII coaches have managed to creep into the set. The layout is little changed, although the semaphores and signalbox disappeared following the Exeter MAS scheme of the mid 1980s. Photograph courtesy Peter Lovell. Having worked from Exeter to Paignton earlier in the morning, 25206 returns to Exeter with the 11.04 from Paignton. 25206 was allocated to Laira from March 1978 to October 1980, after transfer off the Western Region its next home would be Springs Branch. At the end of the summer 1980 timetable 25206 was transferred to Springs Branch, with the last recorded working prior to transfer being a roundtrip Exeter St. Davids - Barnstaple on September 20th 1980. Railtour duty on March 3rd saw 25206 & 40111 working the 'Tubular Belle' Euston - Blaenau Ffestiniog railtour between Llandudno Junction & Blaenau Ffestiniog (out & back). On June 16th 25206 & 25202 worked a Birmingham New Street - Llandudno Town day excursion from/to Crewe. Two weeks later on June 27th 25206 & 25141 worked a roundtrip (?) relief Blythe Bridge - Llandudno Town. The 09.42 Poole - Manchester Piccadilly on October 17th with 47519 required assistance from 25206 at least between Leamington Spa & Birmingham New Street. Two days later on October 19th 25206 & 25209 were noted southbound at Tring with a ballast train. A Wigan N.W. - Wembley Central footbal special on June 5th 1982 required assistance from 25206 & 25054 from Bletchley to Wembley Central when 40133 failed. The surplus of Type 4s and the recently arrived Class 31’s on the Midland did not prevent the use of the Class 25’s on some odd workings during August, on 10th the 12.35 Northfleet – Toton merry-go-round was hauled by 25202 & 25206. The end of August proved quite hectic for 25205 on Cambrian line workings. On August 21st 25206 & 25058 worked the 10.10 Euston - Aberystwyth forward from Birmingham New Street, returning with the 16.05 Aberystwyth - Shrewsbury. On August 22nd the same pair of locomotives worked the 08.45 Birmingham New Street - Aberystwyth, the 16.40 Aberystwyth - Machynlleth and 17.25 return and finally the 18.15 Aberystwyth - Euston to Wolverhampton. The following week, and now attached to 25209, 25206 on August 28th worked the 10.10 Euston - Aberystwyth from Birmingham New Street, returning with the 16.05 Aberystwyth - Shrewsbury. The next day (29th) the same pair worked the same diagram as was handled on August 22nd. 25206 underwent an 'E' exam at Tyseley during December 1982. 25206 & 25117 came to the rescue of 56031 on July 19th after the Class 56 suffered a turbo-charger failure working an ARC stone train at Verney Jct, the Class 25s taking the working to Wolverton and then the broken Class 56 to Bletchley for examination. The recorded passenger workings for 1983 all featured the Blackpool North - Manchester Victoria workings, including a round trip on October 17th 1983. The workings for 1984 showed a heavy bias to the north-west, starting with the 21.44 Preston - Liverpool (off the 18.20 Glasgow - Manchester) on March 14th. June 2nd brought three trips, the 06.30 Preston - Barrow, the 08.20 Barrow - Liverpool and the 16.14 Liverpool - Preston. A change of scenery took place on September 3rd working the 12.10 Cambridge - Birmingham New Street forward from Nuneaton Abbey Junction following the failure of 31419. On September 11th 25206 & 40192 were noted on one of the local Speke trip workings. 25206 returned to the north-west during mid September, on September 13th working the 19.35 Blackpool North - Manchester Victoria, then the 21.16 Preston - Barrow and the following morning's 07.33 Barrow - Preston on September 18th/19th & 20th (morning only). On September 21st 25173 worked the 07.33 Barrow - Preston but required assistance from 25206 forward from Dalton Junction. 25206 continued on to work the relief 12.51 Blackpool North - Euston to Preston, then a returning Glasgow Central - Blackpool North day excursion from Preston. Photograph collection of webmaster. A wonderful view of 25206 at Birkenhead, date unknown. 1985 produced a small mix of workings in the second half of the year. On June 1st an afternoon Aberystwyth - Wolverhampton was worked by 25206 & 25268 from Shrewsbury, 25268 failed at Cosford and was dragged to Wolverhampton. The 16.15 Glasgow Central - Liverpool was worked forward from Preston by 25206 on July 8th. Two weeks later on July 23rd 25206 handled the 14.10 Cambridge - Blackpool North from Preston, 45016 was taken off because the driver did not have traction knowledge for the Class 45. The next day (24th) 25206 worked the 06.30 Blackpool North - Euston to Preston. 25206 was north of the border on August 23rd 1985, with 25059 working the relief 10.41 Exeter St. Davids - Edinburgh forward from Carstairs. The last recorded passenger working for 1985 saw a visit to the North Wales coast, on September 25th handling the 15.18 Llandudno Town - York as far as Manchester Victoria. 1985 (? ): The return to traffic for Hornby Docks saw 25206 working the first (trial?) service to Hornby Docks for many years using BDA 961116, with the first traffic being from Workington BSC with steel sleepers for export to Africa. 25206's final recorded passenger working took place on February 3rd 1986 piloting 47588 on the 21.10 Euston - Stranraer Harbour forward from Ayr. 25206 handled a Tyne – Carlisle cement working on February 6th. On Tuesday February 18th 25206 worked the 3J14 12:36 (MSX) Preston Up Goods Loop - Manchester Red Bank Carriage Sidings parcels (formed of M7191, M93831, W93216, M84078, W93172, M84196, M84053, 93885, M93981, M93485, W93503, E9360?). On March 7th 25206 traversed the Hindlow branch with a single wagon. 25206 was withdrawn on March 21st 1986. Finally in June 1995 the remaining hulks at Bescot, which had now been withdrawn for about nine years, were dispatched by road to Glasgow and quickly dealt with. Six locomotives had originally been placed in Bescot’s down local sorting siding during 1985. Several had moved on, 25206 went to Doncaster Works in 1990 to become a parts source for 25912, preservationists claimed 25235, leaving 25194/205/211/259 to await their fate. However through the continuing generosity of the management of MC Metals these hulks, as well as those received previously, were broken up only after they had given up many valuable components, including complete bogies, power units and generators to various preservation groups. For these groups this would be the last such opportunity, as the Sulzer engined Type 2, Classes 24 - 27, was now extinct outside of preservation. The remnants of the Class 33 still lingered on the SR but their window of existence was closing inexorably, and for 24/25 preservationists they could only supply some compatible parts. 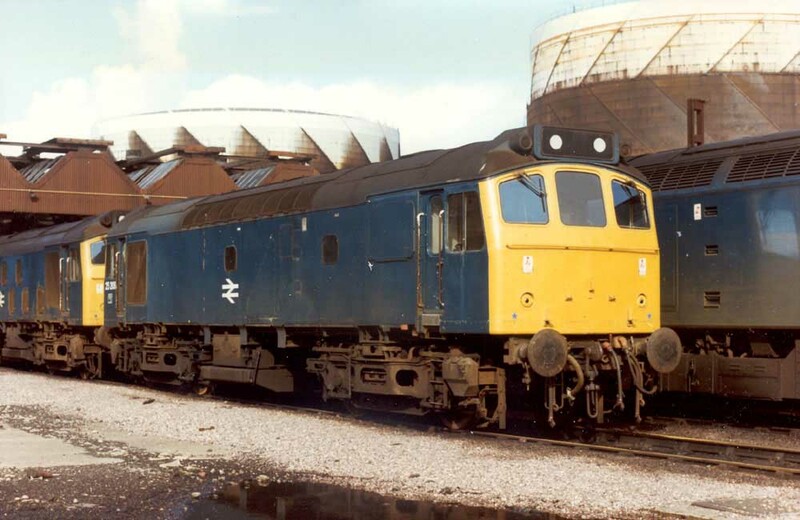 But there still existed one machine, 25083 at Crewe Electric depot, which had so far defied scrapping and would eventually reach preservation. Page added June 8th 2013.